If you’re looking for a way to jazz up your Thanksgiving feast this year you might give one of our favorite recipes a shot! This herb roasted turkey recipe has been a staple on our table for years, and when paired with our mouthwatering herb candied walnut cranberry sauce it’s simply impossible to beat. Passanante’s Home Food Service looks forward to the holiday season all year because we love showcasing our favorite and most festive recipes, but we want to hear yours as well! Hop onto our Facebook Page and share your recipes! This Turkey Day We’re Thankful for YOU! 4. Warm 4 cups of the chicken stock in medium saucepan over low heat. 5. Season the cavity of the turkey with salt and pepper and fill the cavity with half of the carrots, celery, and onions. Rub the entire turkey with the herb butter, season liberally with salt and pepper. 6. Scatter the remaining vegetables on the bottom of a large roasting pan. Fit a rack over the vegetables and put the turkey on top of the rack. Pour the remaining 2 cups stock into the bottom of the roasting pan and put the pan in the oven. Roast until the turkey is light golden brown, about 45 minutes. 7. 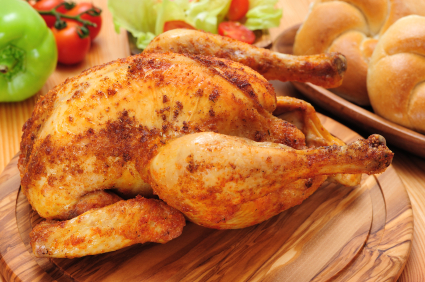 Reduce the oven temperature to 350°F and continue roasting, basting with the warm chicken stock every 15 minutes, until an instant-read thermometer inserted in the thigh registers 160°F, about 2 1/2 hours. 8. Remove the turkey from the oven, transfer to a large cutting board, tent loosely with foil. Let rest for 30 minutes before carving. 9. Strain tock in the bottom of the roasting pan through a strainer lined with cheesecloth into a medium saucepan. Discard the solids. Boil the stock until reduced to a sauce consistency. Arrange the turkey on a large platter and drizzle with the reduced stock. Preheat oven to 425°F. Mix first 7 ingredients on heavy rimmed baking sheet. Roast until edges begin to bubble, about 15 minutes. Remove from oven; maintain oven temperature. Bring wine mixture to boil in small saucepan. Stir into cranberry mixture. Roast until juices bubble and cranberries shrivel, stirring occasionally, 10 to 15 minutes longer. Transfer to medium bowl; cover and chill until cold, about 2 hours. Preheat oven to 425°F. Line rimmed baking sheet with parchment. Stir sugar and wine in small saucepan over medium heat until syrupy, about 3 minutes. Stir in walnuts and herbs. Transfer mixture to sheet, spreading out and separating nuts. Roast until nuts are brown, stirring occasionally, 8 to 10 minutes. Cool. Break up any clumps of nuts. 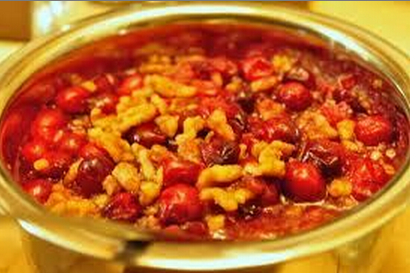 Add nuts to cranberry mixture. This entry was posted in Poultry, Recipes and tagged Cranberry Sauce, Free, Herb Roasted Turkey, Passanante's Home Food Service, Thanksgiving Recipe by Passanante's Home Food Service. Bookmark the permalink.